Thread rolling is a vastly different process to any other type of threading – rather than cutting and grinding the material the thread is formed using cool forging, much like knurling. Thread rolling is the best way to produce the strongest, most precise threads when machining any ductile metal. The thread is strong because rather than cutting through the material grain, you form the material into a threaded shape using dies. This means the thread can withstand far great amounts of stress than thread created under any other machine process. Also, as the threads are formed this way, they have an excellent surface finish, making them perfect for machinery assembles where the thread mates with female components. With the seamless finish and strength which thread rolling offers, it is a vital process in the creation of any aircraft. Ford undertakes all thread rolling procedures in accordance with WHPS 390 standards, thread rolling with cut and ground precision blanks, with a surface finish between 4µ and 5µ. 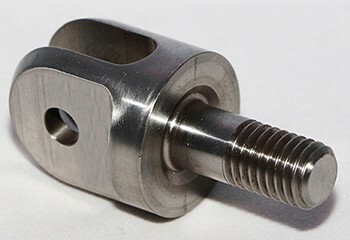 Ford Engineering is capable of left and right hand threads from a range of materials include steel, stainless steel and titanium, with sizes ranging from Metric M4 to M30, up to 250 mm long. All of our components created using thread rolling are inspected in-house to ensure that the thread is correctly formed without any defects being present. Using metallurgical examination techniques Ford Engineering places a specially treated sample part under a microscope and due to the process the part undertakes, the inspector can see the individual grains which run through the components thread, checking that it conforms to the specification. This part is particularly complex to make, as it must be milled so that the fork is complete and then transferred to a lathe to allow the remaining bar to be turned down to size. It is thread rolled in order to produce a high quality thread and is then sent out to subcontractors for treatment processes. This spigot is another example of a component which requires thread rolling. Prior to this, the part must be manufactured to the correct shape, which would be carried out on a 5 axis CNC milling machine. It would then be transferred to a lathe to reduce the overall diameter, with the thread added as the final operation. 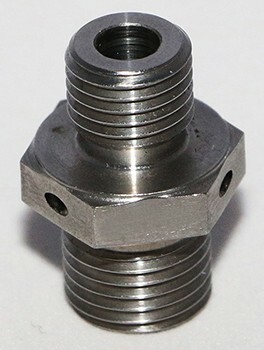 This Adaptor has been expertly thread rolled in a turning operation to ensure that the threads do not fail during the operational life of the component. 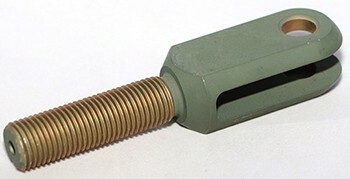 The adaptor is used as a connecting piece between two critical components within the final assembly and requires additional features, such as holes to allow wire locking of the component.